I just recently learned about the game, “Five Nights at Freddy’s”. Upon searching through the top paid apps on iOS I was astonished to learn that THREE versions of this game were in the top 10 paid apps! 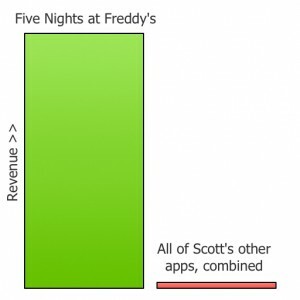 The amount of money these games must be making their indie developer, Scott Cawthon, is likely in the tens of thousands of dollars per day, if not more. 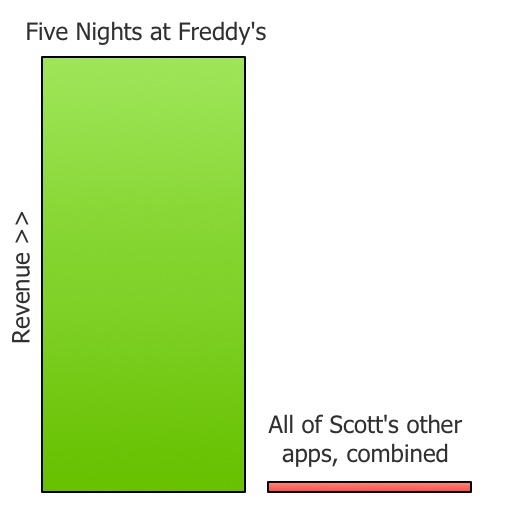 I decided to see what Scott had in his app portfolio. I learned that for a long time he made Christian games and other games that did very poorly and had a negative return on investment. It took him well over a decade of making games before he created “Five Nights at Freddy’s” and struck gold. The game is very simple, yet very, very polished and well thought out. The simple game play and ambiance and feeling of getting “jump scared” really make the game remarkable. It is very clear that Scott learned more and more over his career to the point where he could create a game like Five Nights at Freddy’s. It wasn’t his first game. It was likely closer to his 50th game. Just watch this video on YouTube, it’s pretty telling. Notice the effects in the game, the static, the background noises, the graphics and voice quality, etc. I recently read the book, “Zero to One” by Peter Thiel, that talks about “the value of your portfolio”. He is a venture capitalist. His portfolio consists of Facebook, another solid company, and lots of other companies that are failing or not returning what he put into them. With all the companies that he doesn’t get a return on, it doesn’t matter. Facebook was such a home run hit, that his investment firm is essentially set for life. Peter’s strategy when investing is to only invest in companies that have the POTENTIAL to return the entire value of his portfolio. He argues that playing it safe with a lot of mediocre / low risk investments MIGHT allow you to break even, but more likely will cause you to lose money. This makes a lot of sense to me. As an indie app developer, you may be tempted to do your own pet games or apps, but this has the great potential to be a recipe for failure. Any app that you create must have the potential to reach millions of people in order to support you and your family. – The app must be addictive – people either need to love using your app or need to love watching people use your app, this will add to people spreading the word and driving downloads, etc. I think this touches on the key points about your app. When thinking about an app idea, make sure to check all of these points off first, otherwise I believe there is a high probability of failure for your app. Good luck app developers, never give up, never surrender.